Crib-biting in horses might be related to a lack of trace element selenium in their diets, fresh research suggests. The researchers, led by Dr Arash Omidi from Shiraz University in Iran, and including Dr Matthew Parker at England’s University of Portsmouth, say their findings suggest crib-biting shares similar characteristics with some human neurological or psychiatric conditions such as schizophrenia and autism. 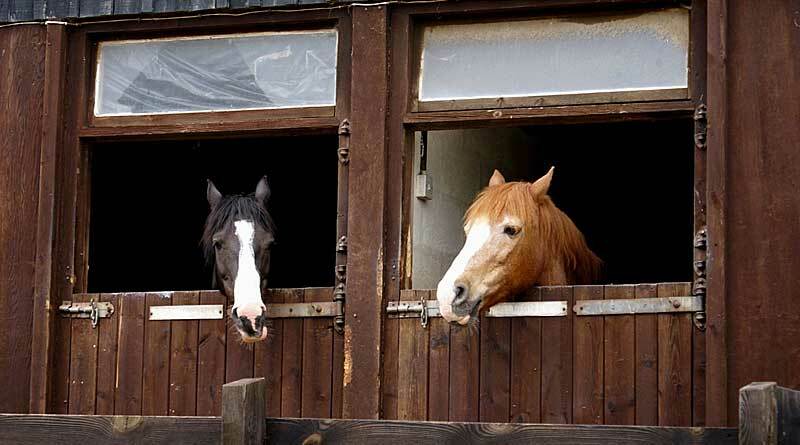 The study, reported in the Journal of Veterinary Behaviour, is the first to test the role of trace elements in crib-biting – a repetitive and compulsive behaviour some horses develop where they bite an object and grunt. Parker, of the university’s School of Pharmacy and Biomedical Sciences, said: “Selenium deficiency has been linked to some human psychiatric conditions and even to bad moods, but until now, there has been no research on the effect of trace elements in crib-biting horses. “Crib-biting is a compulsive disorder that can be distressing for owners, can cause damage to teeth and has been linked to colic. Owners and vets worldwide have tried numerous ways of fixing it without success. He urged caution over selenium dosages, though, warning too much would be toxic to horses. The recommended daily amount of dietary selenium is 0.1mg/kg of daily diet, but more than 2mg/kg is toxic. For horses, selenium is found naturally in hay, pasture and grain. It is also commonly added to commercial horse food, underlining the importance of owners checking their horse’s existing dosage from commercial foods and the foraging environment before adding more. He said: “People should be very careful giving selenium supplements. Some soil, particularly in parts of the USA, have selenium-rich soil and adding a selenium supplement can be dangerous. Low levels of selenium have previously been recorded in humans with schizophrenia, a condition which, the researchers say, is more common in areas where the soil contains very low levels of selenium. For humans, selenium can be sourced from Brazil nuts, eggs, chicken and a range of other foods. The researchers tested the blood of crib-biting and non-crib-biting horses for nine trace elements during crib-biting and afterwards. The trace elements measured were selenium, magnesium, zinc, sodium, potassium, copper, calcium, phosphorus and manganese. All mammals, including horses and humans, need tiny amounts of these trace elements to function well and all can be sourced from food, if the diet is good. They also tested for enzymes, glucose, endorphins and some hormones, including cortisol – the so-called stress hormone. Cribbing is considered a stereotypic behaviour. Crib-biting has been recorded in a small proportion of the horse population for centuries but no conclusive reason for the behaviour has yet been found. It has been called “strange” and “incurable” and has been blamed on a host of different things, including boredom, a side-effect of ulcers, or too much sugar in the diet. Some believe the behaviour gives horses an endorphin rush, making a horse want to keep doing it. It is almost always seen in horses who are stabled and is said to cause expensive damage to stables and a great deal of worry for owners. In the next phase of their research, Parker and his team will be examining the effects on crib biting of dietary supplements, in particular, diets high in selenium and other antioxidants.